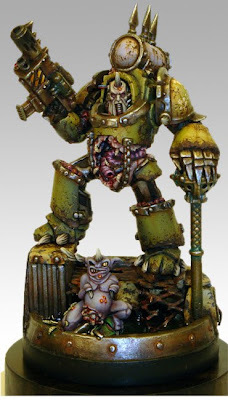 Decided to pick up my first Miniature Mentor tutorial yesterday as the tutorial looks at a figure painter and figure I really admire - Todd Swanson's Plague Lord Festus, the 2008 LA Slayer Sword winner. The promise of 5 + hours worth of high quality video tutorial and an extensive pdf. 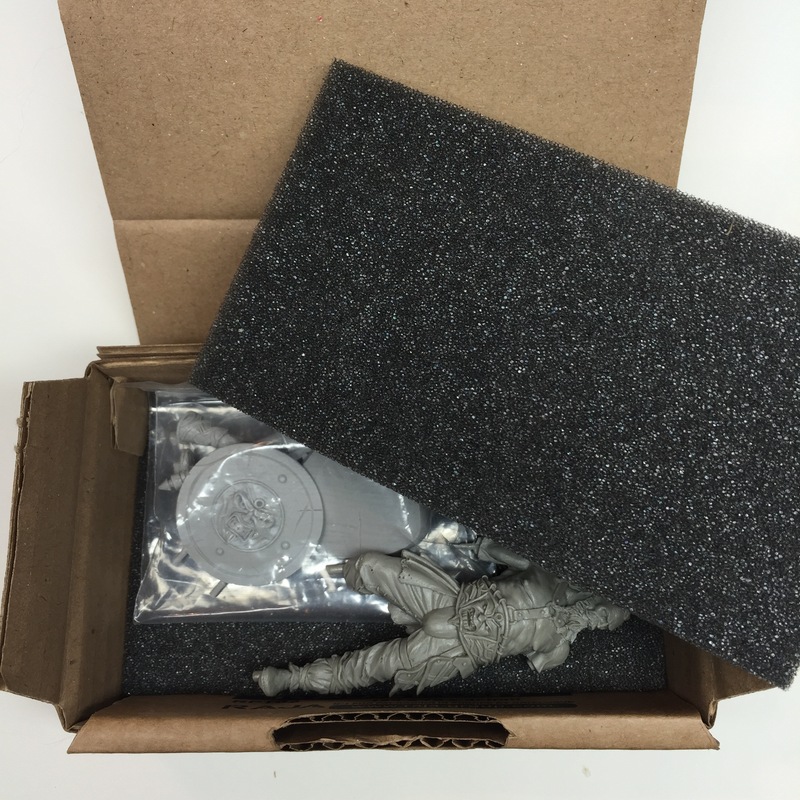 file covering the Festus figure from start to finish was too much for me to resist. £16 and 2 hours of downloading later I had five 1 hour video files, a 15-20 min interview video, 64 page Festus Walkthrough pdf. and an excel colour conversion chart - pretty good value for money! I started by reading through the pdf. as it was quickest to download and gave me something to do while the video files downloaded. The walkthrough gives a pretty thorough and highly insightful account of the entire process, from receipt of model (Todd created the figure as part of a GW Slayer Sword winner challenge - they only allowed the use of the 40k Chaos Terminator Lord kit parts and any scratchbuilt items), to sculpt and conversion work, creation of the base (very interesting part!) all the way through to the painting and assembly with plenty of good quality close-up photos at each stage. After reading through this, I got stuck into the videos. The interview with Todd was quite simple but had a few points of interest about Todd's equipment preferences etc. It's always interesting to me to see how other painters work, the equipment they use and why they choose to do so. For the actual tutorial videos themselves Todd works on a few example pieces, not actually from the Festus figure, but showing the same techniques used. The videos cover Todd's highlighting, shading and blending technique for the base armour colour - covering a number of important technical skills, the chipping and rusting process over this base armour colour - using the sponge method similar to that which I have described previously, freehand technique, and how Todd paints and weathers exposed metal. The quality of the video image is very good, with good lighting, focus and sharpness of image. Every stage is covered in extended detail, allowing you to really see how smooth transitions and natural weathering are built up. The audio is also pretty good, with Todd and the Miniature Mentor presenter (I don't think he mentions his name?) giving pretty good commentary on what Todd is doing, the techniques, equipment etc. Having watched 4 + hours now (last video still to watch), I already feel I have picked up quite a lot that I will be applying to my own painting and modelling efforts. It really has been well worth the cost and I'm already eyeing up a few more for future viewing. If you haven't already, I recommend checking the Miniature Mentor tutorials out. Even if you consider yourself an experienced painter, I can guarantee you, you will learn a number of cool new tips and techniques from some seriously talented guys! To check out the full range of tutorials available from Miniature Mentor you can click the image advert at the side of this page (and help earn me some affiliate income! :D ), or click here to visit their website. Recently I picked up some Squadron White modelling putty to test out a new small gap and seam line filler in place of my old method, the milliput wash. The Squadron putty comes in both green and white form in an oil paint style tube. I opted for white as it had been given better reviews on some military modelling forums. The putty can be used straight from the tube, though it's a little more difficult to apply and will be a bit more grainy. Instead I choose to mix it with some Acetone to create a goopy paste that can be spatulad onto the required areas. It's worth pointing out that acetone can be pretty nasty stuff, so take care when using it and work in a well ventilated area. Also - Don't try this method on plastics - the acetone will melt them! Resin, metal and sculpted putty surfaces should be fine though based on my own experiences. Once the mix is applied (you don't have to be too careful), leave it to dry for a few hours until it is solid and dry right the way through. When dry, you should be left with a rough blob on the area you want to fill (as above - I forgot to take a pic of the gap but it was basically a hollow formed by the casting vents). This can then be sanded away using some fine grit wet/dry paper until all that is left is the flush filled gap. Simples! A nice smooth, gap free surface achieved with the minimum of effort!